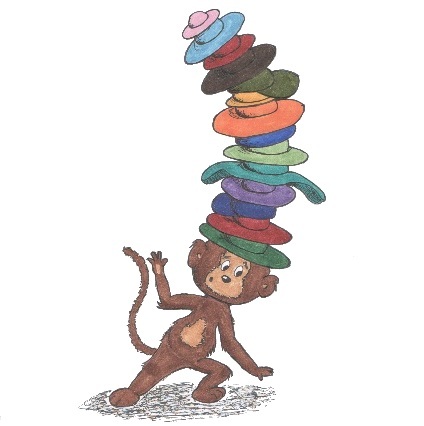 The idea for this week is a casual game about a monkey who likes hats. You have to make him sway back and forth to collect hats and then make sure they don't tip and fall off his head as he journeys forward. You play a monkey who is moving forwards, ever forwards. On his journey he passes by hats. Some hats are smaller and harder to reach than others and are worth more. As he collects the hats he puts them on his head. Very quickly he has a large pile on his head and they teeter from side to side as he walks. Luckily this helps you collect even more hats, since you pick up hats when they are touched by the monkey's body or one of the hats on his head. You must be careful though! If the pile of hats gets overbalanced it will fall and then you'll loose all the hats on your head. Fortunately, you pass by trees on your journey and you can decide to leave the hats you've collected on the trees for safe storage. This means you'll never loose those hats, but it also means you'll have less hats on your head and therefore less reach to collect more hats. The game is played on a smart phone or Wii balance board. The monkey is constantly heading forwards. You, the player can only change which direction he leans in on his journey. To reach hats you must sway from side to side. If you have a large number of hats on your head, they will sway out further so you can collect hats a longer distance away. The game will only take a short time to play and the player's score is based on the points earnt. The number of points you get for a hat depends on its size: small hats are harder to reach, but are worth more points. If a pile of hats falls off your head, you loose all the points that they gave you. Players will need to decide how to balance between storing hats on trees and risking them in order to get more. For example, a very high value hat could be placed very close to a tree so that the player cannot get to both the hat and the tree. The game is short, so that players will think they could have got a better score if they had taken more risks or less risks. Either way, the player will always think that they can improve their previous score and so will be encouraged to play it again.